Sipper Club Card it’s a loyalty card, only available in Gloria Jean’s Coffees shops. The Sipper Club Card rewards your loyalty with offers, treats, special prices for coffee beans etc. Sipper Club Card it’s not a paying system, in exchange for a number of acumulated points, you may receive a gratuitousness from Gloria Jean’s Coffees. There is no way to split the order between cash or card and points. Sipper Club Card exists in 2 versions, physically and virtually: one of them it’s a plastic card, nominal, using a unique code bars identification method. The virtual Sipper Club Card can be obtained by downloading the app on your device (smartphone or tablet) called Virtual Cards. You can have both of them simultaneously. For more details about this feature, please check the link Virtual Cards App. The Sipper Club Card it’s available only after you fill the form provided by Gloria Jean’s Coffees at the adress Sipper Card Form. 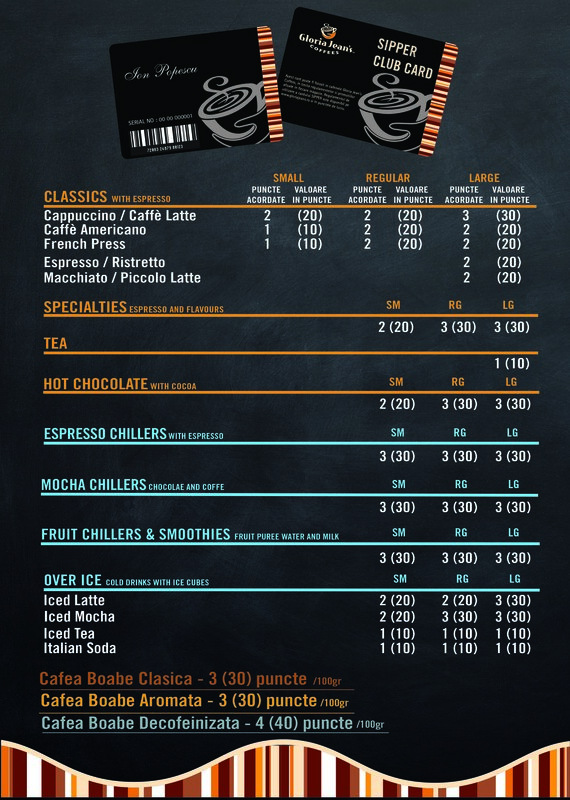 Just the beverages and coffee beans choices have corresponding points which are recorded on Sipper Card. As to products and items which already benefit from discounts, no points are granted. In order to gather the points or to use them for obtaining a free product, the Sipper Card have to be scanned at the cash register before emitting the receipt. After the receipt is emitted it’s impossible to assign the points for that order. Scanning the Sipper Card to cash register it’s made directly by the guest, handing-in to an employee in order to be scanned it’s strictly forbidden. Sipper Club Card can be used in Gloria Jean’s Coffees shop, except those from Henri Coanda International Airport.